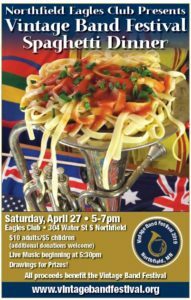 The 4th Annual Vintage Band Festival Spaghetti Dinner Benefit will be held Saturday, April 27, 2019 at the Northfield Eagles Club, 304 Water St South, from 5-7pm. Dinner includes spaghetti marinara with parmesan cheese, green salad with multiple dressing choices, French bread and butter. Cash bar available. Live music will be played throughout the evening. Music provided by Bridge Square Band and ensembles from St Olaf College and Northfield High School. Tickets are $10 for adults and $5 for children and will be available at the door. This entry was posted in VBF News on April 18, 2019 by Paul Niemisto. This entry was posted in VBF News, VBF2019, Vintage Instruments and tagged Carleton College, Early Brass Festival, Historic Brass Society, Vintage Band Festival, Weitz Center for Creativity on March 30, 2019 by Dan Bergeson. 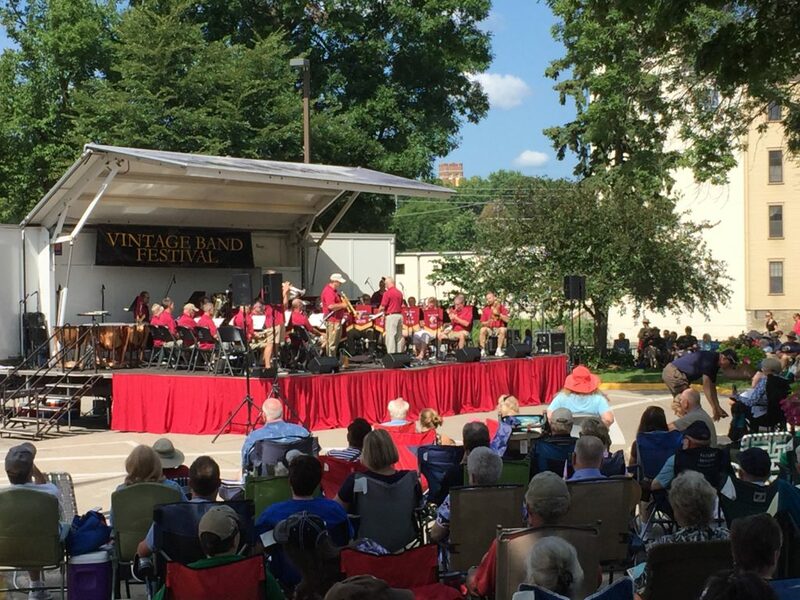 Vintage Band Festival 2019 takes place August 1-4, 2019 in Northfield, Minnesota. During that time we provide housing for all of the bands that travel to Northfield from outside the state of Minnesota. This is particularly important for our international musicians who are the first to arrive in town. We will be welcoming bands from Germany, Belgium, Sweden and Finland for the 2019 festival week. This year we need to find housing for approximately 25 musicians for five nights (July 31-August 5) That means we are looking for families to offer homestays for 1-4 musicians depending on available space in their homes. The German and Belgian groups are quartets, the Swedish band has seven members and the Finnish band has ten members. We are looking for housing only as the musicians will eat meals elsewhere during the day wherever they are performing. The households that offered homestays for our festival in 2016 reported having a marvelous time with their guests and our musicians told us how grateful they were for the hospitality provided by Northfield families. This is a wonderful cultural exchange opportunity for everyone. If you are willing to be one of our host families for 2019, please send us a message at vintagebandfestival@gmail.com and let us know how many people you have space for. We will be in contact with you promptly and begin making plans for the musicians’ arrival on July 31. This entry was posted in VBF News, Volunteer for VBF and tagged À râse dè têre, FinnBrass, Medevi Brunnsorkester, Original Drachenfelser Musikanten on March 19, 2019 by Dan Bergeson. The lineup is set for the Thursday-Saturday evening shows on the Bridge Square main stage at Vintage Band Festival 2019. 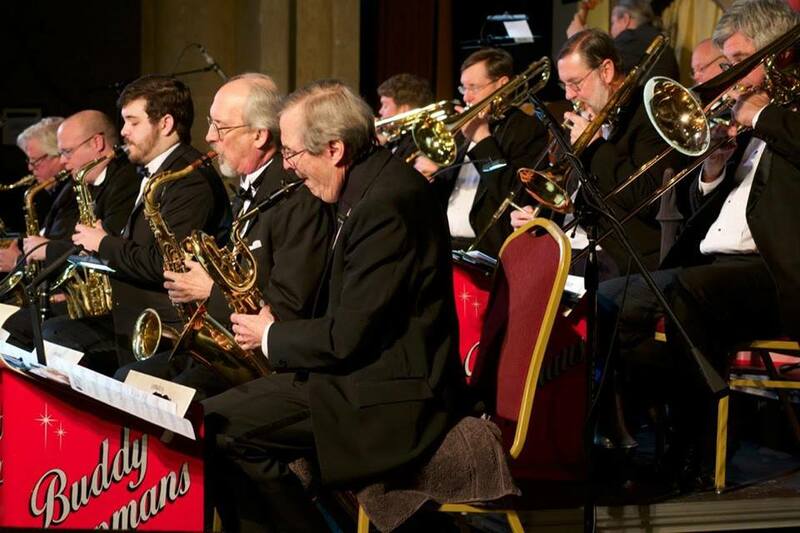 New to the VBF stage this year will be Bend in the River Big Band, a 19-piece swing band playing for the Friday night Victory Dance; and Hornucopia: A Tribute to Horns in the Rock Era. The other six bands have performed at Vintage Band Festival in previous years and are coming back due to audience accolades. The Jack Brass Band formed in 1999 in the Twin Cities metro. Based on the traditions of New Orleans brass bands, they are ambassadors of the Crescent City’s rich musical history. The 8-piece band plays “Feel-Good Music” for audiences of any age, for any occasion. JBB has the ability and repertoire to play everything from old New Orleans jazz from Louis Armstrong’s era, to the modern street Mardi-Gras anthems with the instrumentation, feel, and energy they have mastered through countless gigs, parades, festival appearances, and trips to New Orleans to listen, learn, and play alongside the masters. Mariachi Mi Tierra is the oldest Mariachi ensemble in the Minneapolis and St. Paul metropolitan area. Rosalio Castro (trumpet), who formed the group in 2003, has played various Mexican styles of music since he was in his teens. Eduardo Castro (also trumpet) is the group’s director. Together, the Castros have brought together a group that produces the full sound of authentic mariachi in Minnesota. The group’s repertoire includes a number of regional and current favorites. In addition to events in the local Mexican community, Mariachi Mi Tierra plays at schools, colleges, businesses, casinos, and festivals. 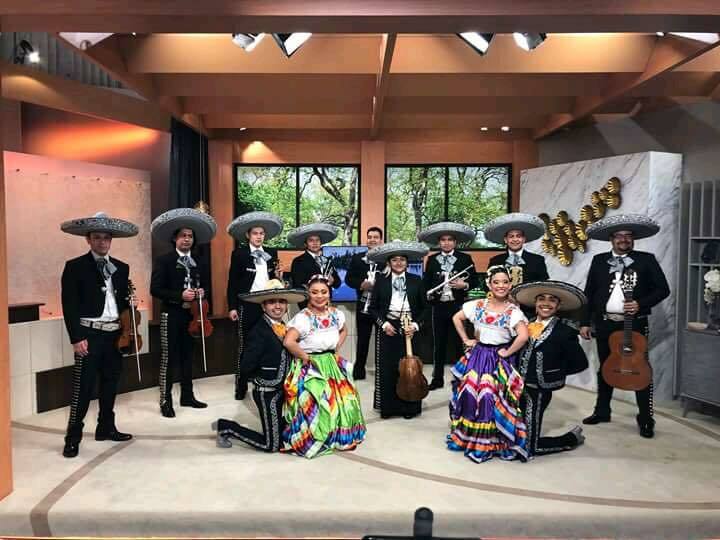 Mariachi Mi Tierra performed previously at the Vintage Band Festival in 2014, 2015 and 2018. 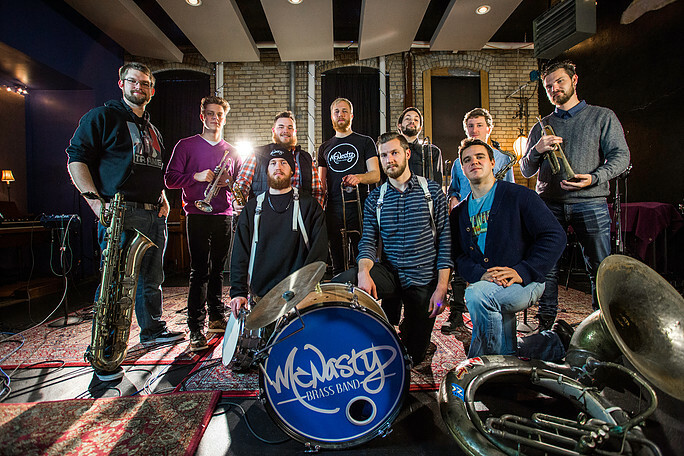 McNasty is a collection of Minneapolis/Saint Paul-based horn players and percussionists that fuse the Minneapolis sound with the spirit of New Orleans. The outcome of this fusion is hard-hitting dance music and high-energy live shows. Each player works tirelessly outside McNasty Brass Band as a side man, some with national and international touring acts. That’s what makes McNasty special–these youthful but experienced side men come together and showcase their compositions, solos, group vocals, and stage presence as front men. “McNasty Brass Band is a perfect example of why you shouldn’t make fun of the kid who is super into trumpet in 5th grade” (twincitiesmedia.net). “King Size Life,” their first studio album, encapsulates their live energy with exciting compositions, rowdy gang vocals, and rip-roaring solos. The only thing missing is their dance moves! 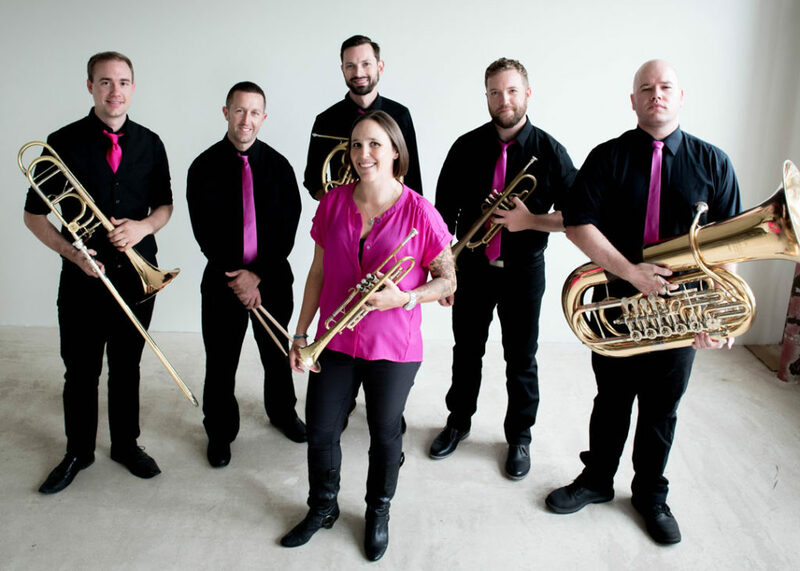 The members of Copper Street Brass have style, substance and a flair for innovation, which has allowed them to transcend the brass quintet box and evolve into something fresh. Copper Street Brass started in Albuquerque, New Mexico, in 2007 and settled down in Minneapolis in 2008. The group’s new tour program, “The Evolution of the Brass Quintet,” features music from Mozart to Dave Brubeck to Adele. Its blend of musical styles and fusion of electronic effects and brass has wowed audiences in communities across the country. Last season the quintet performed for 4,300 students in 25 school residencies throughout Minnesota. Street dances have been a part of Vintage Band Festival for many years. 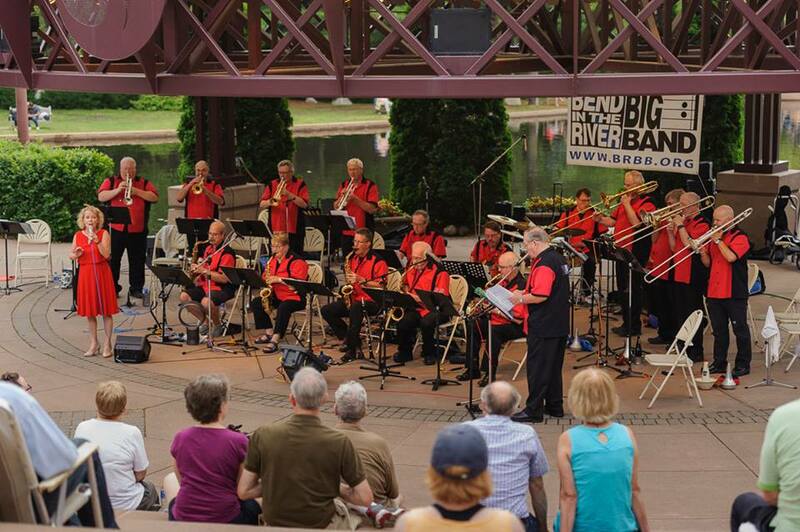 Providing the soundtrack for the 2019 Victory Dance is the Bend in the River Big Band from the Mankato area. The band formed in 1987 from alumni of Gustavus Adolphus College under the direction of Dr. Mark Lammers. This 19-piece ensemble is currently led by Bob Hallquist, who also plays trumpet and percussion. The band’s vocalist is Linnea Marrin. Everyone should bring their dancin’ shoes and be ready to swing! 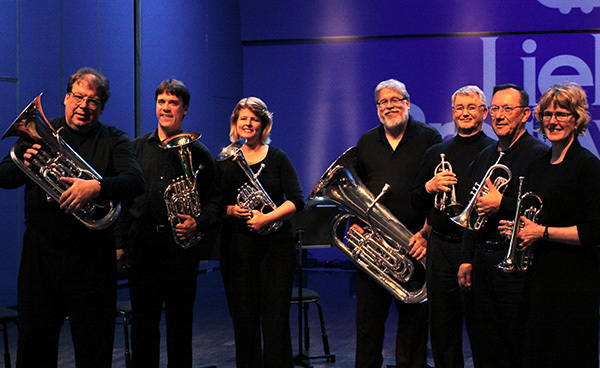 Metro Brass is a group of 11 amateur musicians from the greater Minneapolis/St. Paul area that has only played together for five years. They all play in other ensembles, but come together for the “Metro Brass Sound.” Metro Brass is led by Keith Thompson (trumpet). Southside Aces perform traditional New Orleans jazz. The band began as the brainchild of clarinetist Tony Balluff and sousaphone player Erik Jacobson. The Aces have self-produced and released five albums: All Aboard!! , Bucktown Bounce, A Big Fine Thing, their Christmas album, Santaphone, and their latest, Second Thursday. Their music garnered the declaration, “A true authentic New Orleans dance-hall style band” from the New Orleans Traditional Jazz Quarterly. The Southside Aces have performed at the Vieux Carré and Dakota jazz clubs, Peavey Plaza, Mears Park, Twin Cities Jazz Fest, Hopkins Jazz Festival, and the Doc Evans Jazz Festival. Found at weddings, birthdays, banquets and memorials, the Aces utilize the traditional cannon for its sweetness, its spice, its joy, its sorrow; whatever the mood should call for. In 1969, the music of Blood Sweat and Tears and Chicago Transit Authority (among many others) could be heard on every street corner in America. 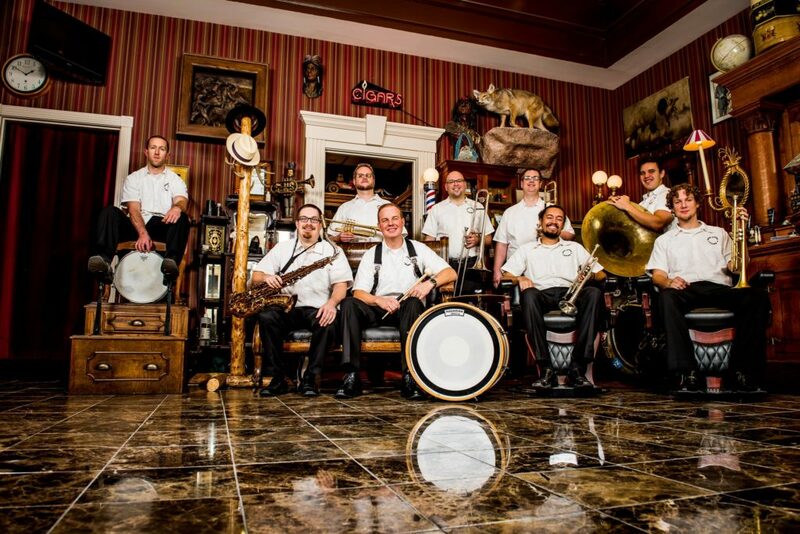 In acknowledging the tremendous contributions of these bands and their music, Vintage Band Festival presents Hornucopia, an 11-member band from the Twin Cities metro performing horn tune tributes of the rock era (1960s to the present). Their music ranges from rock to ska, swing to pop, soul to funk, and Latin to blues. Hornucopia is led by front man and vocalist Kevin Thomas. This entry was posted in VBF News, VBF2019 and tagged Bend in the River Big Band, Bridge Square, Copper Street Brass, Hornucopia, Jack Brass Band, Mariachi mi Tierra, McNasty Brass Band, Metro Brass, Southside Aces on March 5, 2019 by Dan Bergeson. The Board of Directors of Vintage Band Festival invites friends of the Vintage Band Festival and members of the public to its 2019 Annual Meeting. The annual meeting will be held on Monday, March 11 at 12pm in the Assembly Room at the First United Church of Christ in Northfield, Minnesota. The UCC church is located at 300 Union Street in Northfield. The agenda for the annual meeting will include a report of activities and financial results of the recently completed 2018 fiscal year. In addition, there will be an update of planning activities related to the upcoming 2019 Vintage Band Festival taking place August 1-4, 2019. Light refreshments will be available. Questions and comments can be sent to vintagebandfestival@gmail.com. This entry was posted in VBF News on March 4, 2019 by Dan Bergeson. Vintage Band Festival Receives MSAB Grant! 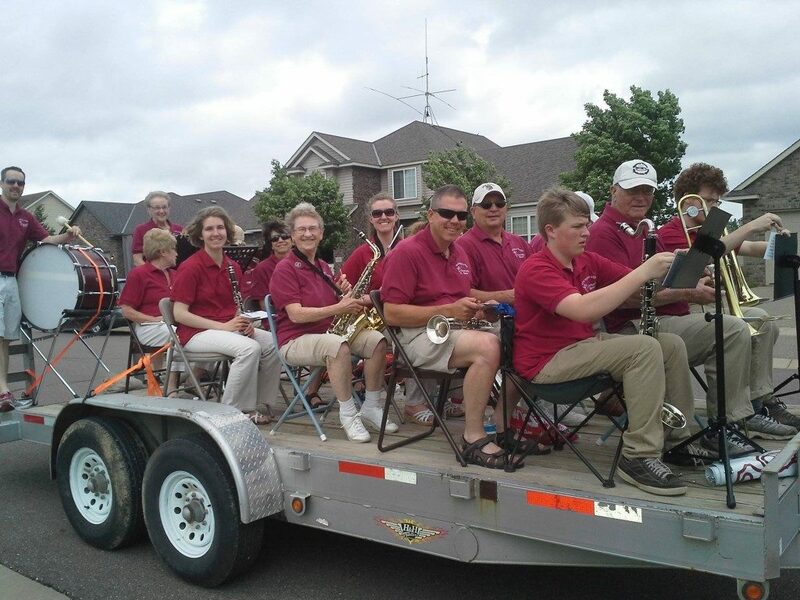 Vintage Band Festival recently learned that it is the recipient of a Minnesota State Arts Board (MSAB) Festival Support Grant for 2019. MSAB Festival Support grants help non-profit organizations such as Vintage Band Festival to engage Minnesotans in festivals that celebrate the arts, build community, and expose communities to diverse art forms including folk and traditional arts. 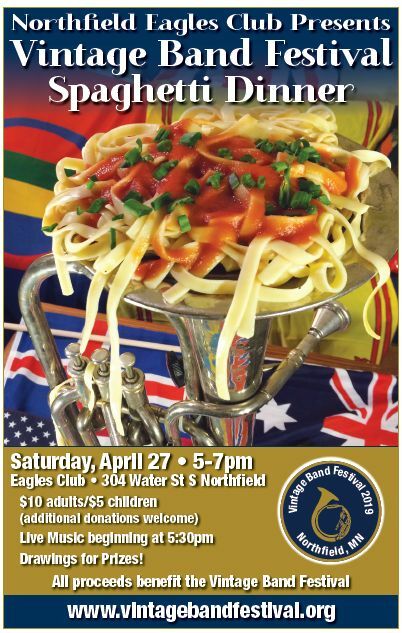 Vintage Band Festival, now in its 12th season, annually presents an international celebration of brass and wind band music of many musical genres and ethnic, historical, and geographical origins. 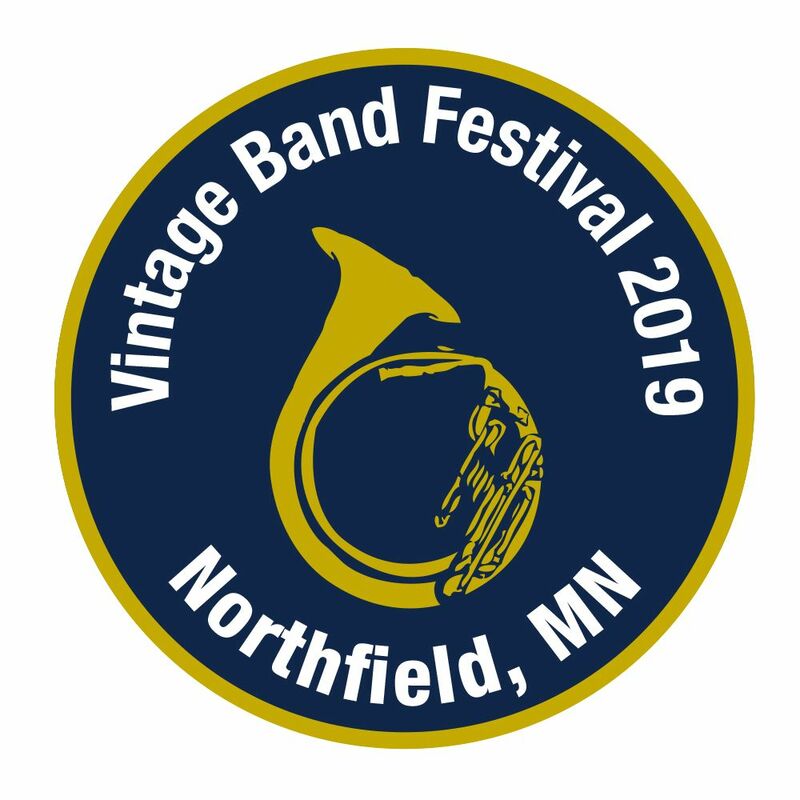 The 2019 edition of Vintage Band Festival will take place in Northfield, Minnesota and surrounding communities August 1-4, 2019. There will be 25 bands playing 100 concerts during the four days of the festival. Most of the performances will be in Northfield, but there will be concerts in at least six other southern Minnesota communities. 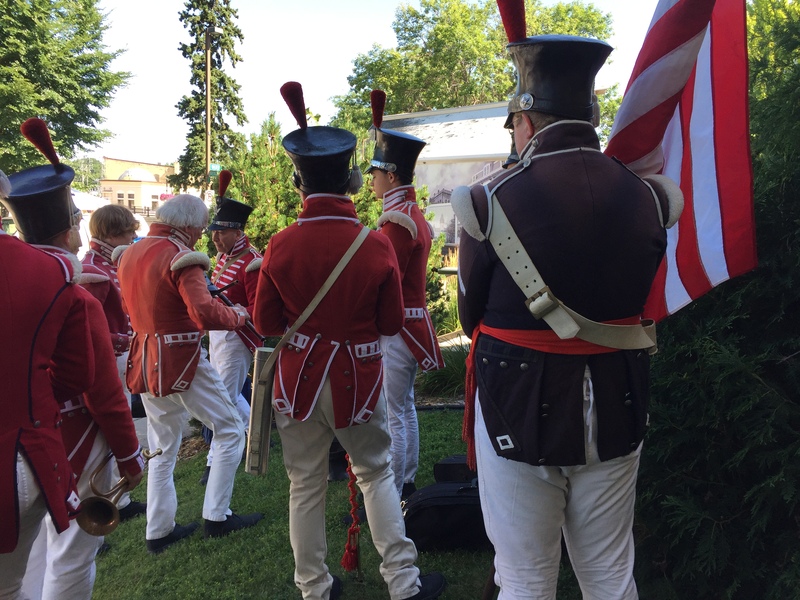 The Northfield performances will take place in Bridge Square, Odd Fellows Park, the Northfield Hospital, the Northfield Retirement Community, Three Links, most of the town’s churches, and several of Northfield’s pubs and brewery taprooms. 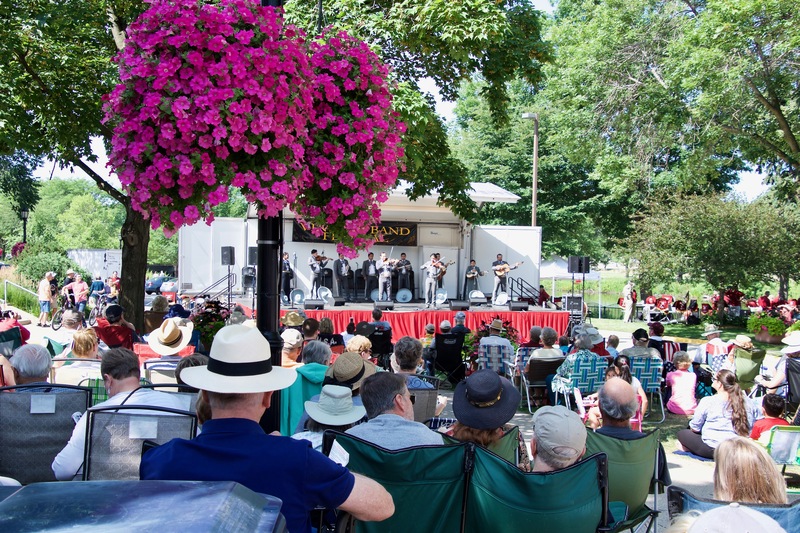 Impromptu performances by participating musicians are likely to occur at any time on the street corners and parks of Downtown Northfield during the festival weekend. Music lovers can get regular Vintage Band Festival updates by subscribing to Vintage Band Festival’s regular e-news offerings at www.vintagebandfestival.org and by following Vintage Band Festival on Facebook and Instagram. This entry was posted in VBF News on August 12, 2018 by Dan Bergeson. The brass septet Ameriikan Poijat (Boys of America) appears at ethnic festivals, regional tours, and music conferences, presenting authentic social dance music and concert repertoire.The band is composed of Finnish-American musicians and teachers from Minnesota and Michigan, and its repertoire is derived directly from original hand manuscript sources found among Finn­ish bands and archives. 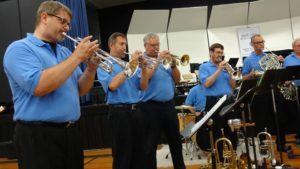 During the 1980s, group founder Paul Niemisto made contact with many Finn­ish brass players and discovered this relatively unknown musical tradition; he formed the group in 1990.Ameriikan Poijat has toured in Finland several times, most recently in 2013, and trav­eled widely in the United States and Canada. Ameriikan Poijat will perform in Bridge Square at 1:00pm on July 28 at VBF 2018. Brio Brass has delighted and entertained audiences throughout Minnesota’s Twin Cities Metro area since 1999.Composed of more than 50 adult musicians, the group performs its own unique arrangements written specifically for its members.The ensemble’s large repertoire features a broad spectrum of musical styles.Audiences are entertained with fluid ballads, pop of all eras, show tunes, funky rock and lots of jazz.Expect lots of humming, toe tapping and even dancing in the aisles! Brio Brass is led by Rick Rueckert. Brio Brass will appear in Bridge Square at VBF 2018 on July 28 at 4:00pm. This entry was posted in VBF Bands, VBF News and tagged Ameriikan Poijat, Brio Brass, Finnish brass band on July 6, 2018 by Dan Bergeson.